HyeKyung Lee (born in Seoul, Korea) graduated from The University of Texas at Austin, where she studied composition with Karl Korte, Donald Grantham, Dan Welcher, Stephen Montague, electronic music with Russell Pinkston, and piano with Danielle Martin and HeaSook Rhee. She also studied with Bernard Rands at the Atlantic Center for the Arts and Ladislav Kubik at the Czech-American Summer Music Institute in Prague. Her awards include the Harvey Gaul Composition Competition Award (honorable mention), Indianapolis Chamber Orchestra Composers Competition, ASCAP Standard Awards, Composers Guild Award, Delius Composition Contest Prize, Nancy Van de Vate Prize for Orchestral Music, Search for New Music Prize from International Alliance for Women in Music, SEAMUS/ASCAP Student Commission and SCI/ASCAP Student Competition Award (honorable mention). Her music has been supported by National Endowment for the Arts, Djerassi Foundation, Ucross Foundation, Blue Mountain Center, and MacDowell Colony. An accomplished pianist, HyeKyung recorded a CD, “Blue” with saxophonist Todd Yukumoto (released on Equilibrium), featuring her own Sonatina for Soprano Saxophone and Piano and Musique Légère for Alto Saxophone and Piano. Her Suite for Solo Piano is available on New Ariel Recordings (performed by Jeffrey Jacob), Opposed Directions for Disklavier and Live-electronics (performed by herself) on Volume 8 of the SEAMUS CD Series, Quickly Casual for Violin, Cello, and two percussions on Robin Cox ensemble Vol. 7, Saxophone Concerto on Mark Custom Recordings (performed by Havery Pittel with the University of Texas Wind Ensemble), conFUsion/comBUstion for piano and tape on Capstone Records (performed by herself). One of her commissioned work, “Dreaming in Colours” for Bassoon and Piano was written for the Meg Quigley Vivaldi Competition 2005 for young women bassoonists under the age of 24. She has been a Composer-in-Residence at Interlochen Arts Academy, University of Houston, University of Florida, University of Akron, University of Missouri at Kansas City Conservatory of Music and has been a visiting assistant professor at the University of Hawaii, Bowling Green State University, Ohio Wesleyan University, and Oberlin Conservatory of Music. Currently she is an Associate Professor of Music at Denison University, Granville, Ohio. 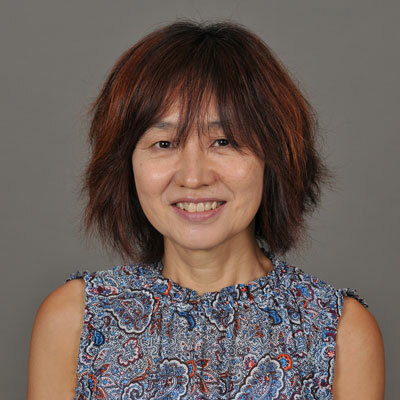 Composer and Associate Professor HyeKyung Lee writes for a variety of mediums, mixing styles and collaborating with others to enrich the experience.